BUT FOR OHIO STATE, WE WOULD NOT HAVE CAPTURED THE MOVEMENT OF ATOMS VIBRATING IN A MOLECULE. 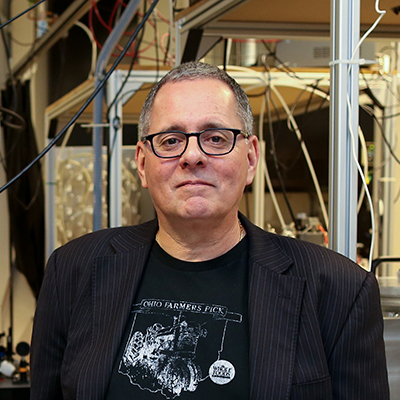 Using a new ultrafast camera, Ohio State College of Arts and Sciences physicist Louis DiMauro recorded the first real-time image of two atoms vibrating in a molecule — a discovery with important long-term applications. Beyond its potential for controlling chemical reactions, it offers a new way to study the structure and dynamics of matter, which will lead to applications in materials science and even chemical manufacturing. A better understanding of one of the most fundamental processes in nature — the way in which light and atoms interact, establishes DiMauro at the forefront of extreme-field, extreme-time physics.